My definition of the word family has really expanded in the last couple of years. The word has morphed into something I have a hard time explaining... but please bear with me, for I am going to try. It all started with a show called "Chuck." It really is as simple as that. I fell in love with a show, and it quickly became my favorite series of all time. Little did I know that becoming invested in a TV series would lead me down the path that it has. Spoiler alert, it's one freakin' awesome path. Becoming a fan of Zachary Levi, I became interested in the amazing party he throws every year during Comic Con, Nerd HQ. Reading other's stories only encouraged me further to attend the 4 day event. Loving nerd culture in general, I also wanted to attend San Diego Comic Con in conjunction with HQ. Only the first time I tried for SDCC tickets, I was unsuccessful. But I decided to take a risk anyway, and book my flight and hotel to attend Nerd HQ. And let me tell you, that was one of the best decisions I've ever made. I became more involved on Twitter, and quickly found a ton of nice people who were also HQers. I even met the entire Nerdy Girlie team through Twitter! (Something I am soooo grateful for.) I always thought forging friendships through social media was odd... but I can say with full confidence that some of the best relationships I have today were first formed via social media. Already making awesome friendships from the first HQ I attended, I couldn't wait for the next Nerd HQ. 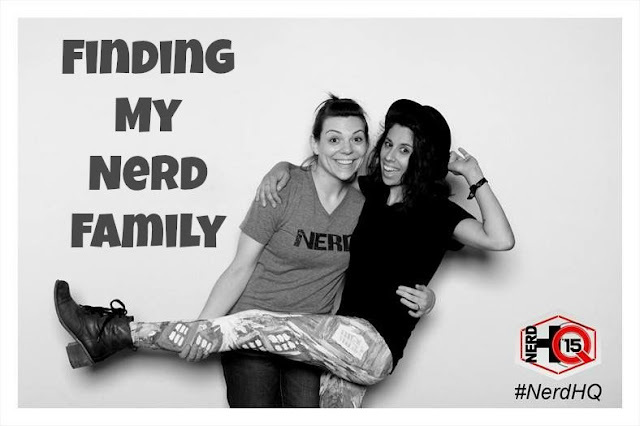 This was the year that the #IWantMyNerdHQ campaign ran, and I met an amazing group of guys and gals who are just the sweetest, most beautiful souls I've had the pleasure of knowing. Needless to say, this past HQ was my favorite not because of the celebrities I saw, but because I got to connect with my friends. The people I have met through Zachary Levi and his company, The Nerd Machine, have blessed me beyond measure. I have laugh, cried, and danced my face off with these people. I've opened my heart and been vulnerable - sharing important yet hard milestones of my life. I've felt an immense amount of love, generosity, and kindness. These people make me laugh on a daily basis, and there isn't one day that goes by where I don't feel their love and friendship. I never thought I could have so many deep & meaningful relationships just from having a common interest in a TV series. Thank you, Zac, for creating this tight community of nerds who genuinely love each other. We owe you so so much. I need to finish the last season!! I think it's finally on HULU non web only! I have been on the same exact path. And it has been every bit as rewarding! At HQ 2015, I was able to meet for the first time and hang out with every person in that picture...EXCEPT ELSBETH, who has very recently proven something I'd always suspected: to be one of the most wonderful, sweetest people to grace this planet. As with everyone else I've met in the Nerd Community, I'm truly honored and grateful to have the privilege of calling her "friend". I'm learning more and more about how strong the nerd community is on social media and online. I hope to forge friendships as you have done! I am blown away with the friendships I have made via social media! Hope you have the same luck as I have.. it's an incredible feeling! Skorp, you're the sweetest! Thanks for taking the time to read and comment. I cannot wait to "officially" meet you at HQ next year and take tons of photobooths! Yes you do, Usagi!!!! <3 Thanks for reading and commenting!!!! That is the best news, Kristin! I hope your fiance enjoys it!!! It's only kinda the best show ever! ;) Thanks for reading!